As an installation artist, I have two different practices: I create privately in the studio and work on large-scale public art commissions. Here are some thoughts about how I try to balance these two ways of working — the open-ended studio process and the structure of site and client in the public art world. I begin by “doodling” with materials. I usually don’t have a plan, but I have something in my head that interests me. Recently I’ve been looking at tall grasses with slender stems that sway in the wind. As I’m working, I try to translate thoughts and images into material form. Often I create a modular unit and repeat it, altering it slightly each time. As the elements accumulate and the installation takes shape, I think about the mood or ambience of the piece and how people will experience the space as they walk through it. The materials I use are translucent or reflective, so they do interesting things with light and shadow. 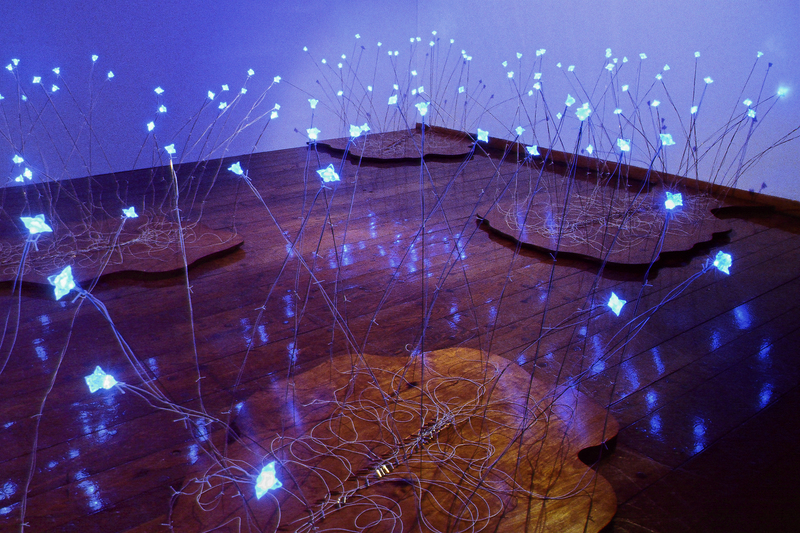 The “Luminous Garden” series is a good example of my current indoor light installations. 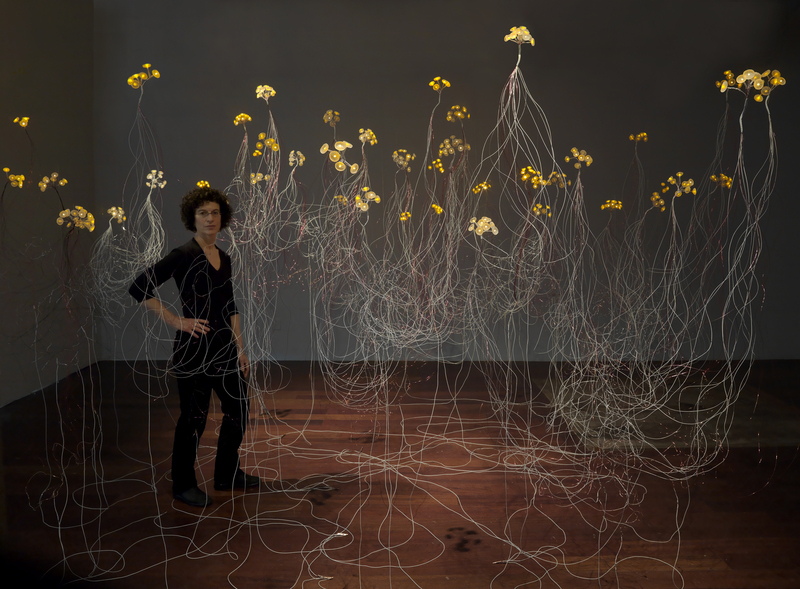 These glowing environments are inspired by nature but made entirely of man made materials–cast resin seedpods, LEDs, wire, and electronics. 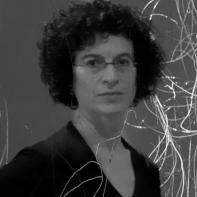 I use the magic of light to create spaces that are experiential and immersive, involving viewers as participants. Here are two images of the gardens: “Luminous Garden” 2003 and “Luminous Garden” 2009. The pieces evolved organically over time through a process of improvisation, rather than being planned in advance. When developing a public art concept, I need to consider certain “givens”: How is the idea appropriate to the client, site, time frame, and budget? Hopefully, these constraints are useful and I don’t put myself in a box. I try to satisfy the needs of the project and remember my own personal need to be playful and loose, as I am in the studio. That’s where the best work comes from. Then the challenge is to hold onto the beauty of the concept and not let it be compromised as I adapt to twists and turns in the process. Right now, I’m working on two permanent public art commissions: “Sound Wave” at Music City Center in Nashville, Tennessee; and “Prairie Grass” at Northwest Service Center in San Antonio, Texas. Here is computer rendering of “Sound Wave,” a 120 foot long suspended sculpture made of undulating metal forms with computer-controlled blue LED lights. It’s based on the image of a sound wave and a musical staff with notes. A sequence of lighting changes ripple through the space as people pass through. I’m trying to bring aspects of my private practice into these public works. How to involve light and magic as I do in the “Luminous Gardens”? How to use nature as an inspiration? How can I engage viewers so they are immersed in the environment? I want these projects to be as personal and rich as my studio work. What do I like best about public art? Learning about new places, meeting new people, and creating an artwork that becomes a part of peoples’ daily lives. Can I combine the best of public and private worlds? Stay tuned…I’ll let you know when these pieces are installed in the spring of 2013.